Emma Lou’s Birthday Blog Hop! This is a very special post for a very special person! Emma Lou is the creative director at Heartfelt Creations and I feel so happy to have worked with her in the past and to know her a little bit better. She is an amazing person, very talented and super sweet. And today we have got together to celebrate her special day through a blog hop. Wishing you a very Happy Birthday and a fabulous year ahead! I hope you have a great day with your family and friends! Also, the Heartfelt Creations team is super sweet and offering a $25 gift certificate to shop at Heartfelt Creations for hopping along and leaving a comment on participating blogs. The hop starts at 8 am EST on Thursday 11th August 2016 and closes on Tuesday 16th August at midnight. So hop along for a chance to win. The winner of the blog hop will be selected randomly and will have 72 hours to claim their prize otherwise another name will be drawn. Lovely coloring on the vellum. What a sweet card for your friend. Thanks for sharing. Beautiful. I like the subtleness of color that is obtained by coloring on the back of vellum. So beautiful. 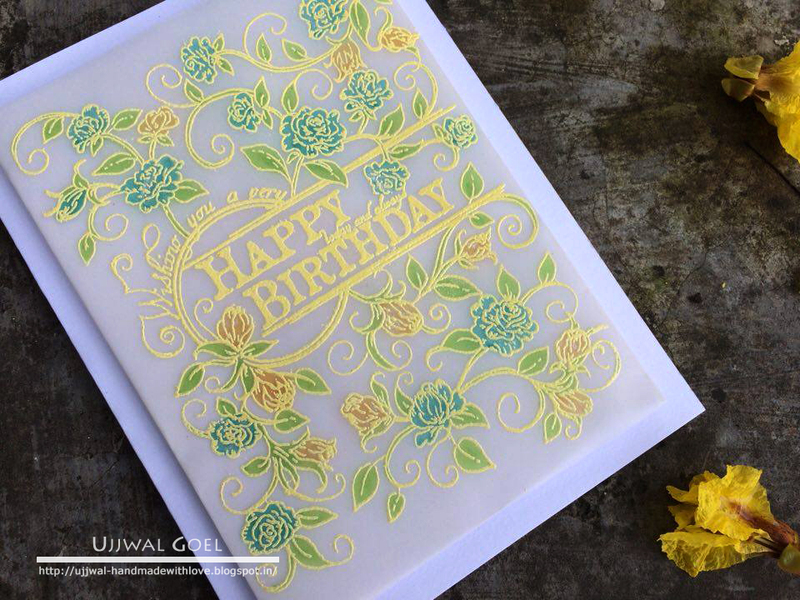 I love the embossing on the vellum and those fantastic colors you used! what a stunning card for a stunning lady. Love your card! Vellum is beautiful! So gorgeous! I will have to try this technique soon! Wow, gorgeous card! I have never tried this technique. So pretty with the heat embossing on vellum. Happy Birthday to Emma Lou. Emma Lou will love this!!!! This is beautiful, I love the colors and always have loved velum. Looks like you stamped on the front and used embossing powders. Did you color the flowers in on the back of the velum? I love the embossing and colouring with that beautiful stamp. Especially love the embossing colour used. Gorgeous card, who wouldn't love it. I love how you embossed it on vellum and colored the back. Wonderful, happy card, I love it! I just love your card. Love this beautiful vellum card! Pretty design and coloring! What a wonderful technique, I must try this. What a treasure of a card! I love that embossing; what a great image! soooo gorgeous! Love the sorbet colors! So summery and pretty! Amazing card, so clean and gorgous at the some time with the delicate vellum and these bright colours! The bckground stamp looks fantastic!!!! Love it! Okay I am in love with the embossing. Very pretty card!!! Happy Birthday Emma Lou!!! Love the use of vellum. Nice card! 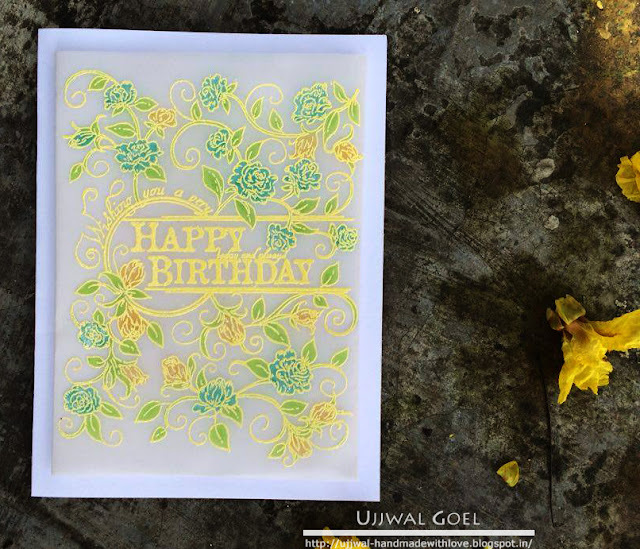 Stunning card, Ujjwal! Love the vellum! Very beautiful card. Luv it! Wowza so stunning! Love the effect on this card and I am sure Emma Lou just loved this one too. What a great thing to do to have a blog hop for her so we can all see these amazing cards. Oh my, Ujjwal! Love the colors! So pretty! Love the time and effort to create beauty. So soft looking and beautiful. So VERY pretty!! LOVE it! I'm positive Emma Lou loved it! It is simple and sweet! TY for sharing! Wow gorgeous!! Love your idea of coloring on vellum, its too good! Heartfelt Creations August Alumni Blog Hop! Fussy Cutting with stamping + Video Tutorial ! Watercolor pencils + pencil highlights! Rakhi Cards with Mudra Stamps!